Owl Creek Pass and Silverjack Reservoir were my goals for June 19th, 2010, and I had a wonderful day on my Yamaha XT-250 going over the pass and down the west, middle, and east forks of the Cimarron River, plus stopping at a nice viewpoint overlooking the reservoir. The GPS track from this marathon is in this post. I’m spreading the photos out a bit, otherwise they’d make for a huge download! 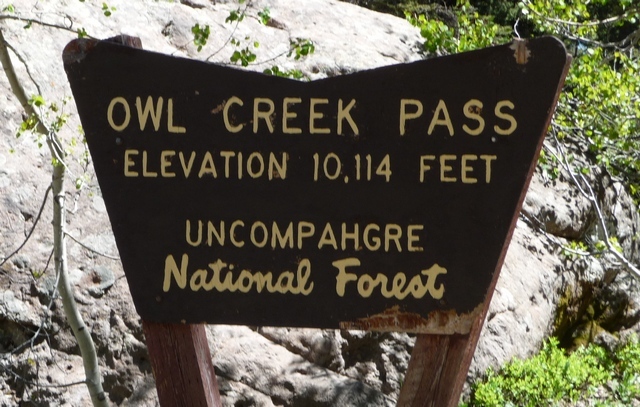 The picture here is the sign at the summit of Owl Creek Pass. You need to be careful not to miss it. It’s well below treeline, and the road runs through thickly-forested land. The sign is on the north side of the road (left if you’re coming from Ridgway). One benefit to seeing the sign is that there’s a parking area up behind it that has some nice views of Chimney Peak, plus there’s a pit toilet for those in need. This entry was posted in Gunnison County, Motorcycling, Ouray County and tagged Colorado, dirt bikes, motorcycling, ouray county, owl creek pass. Bookmark the permalink.